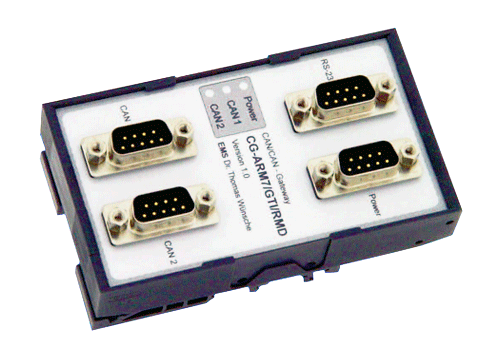 The CG-ARM7/GTI isolated CAN Bus gateway transmits CAN signals between subsystems. CG-ARM7/GTI allows a flexible design of the wiring topology. Star and tree structures as well as extensive line structures can be realized. The galvanic separation between the CAN channels allows the use with diverging ground potentials. The CG-ARM7/GTI obtains its potential through the use of a 32 bit microcontroller with 48MHz clock. Among the available functions are data rate adaption, message filtering as well as identifier conversion between the coupled busses. The restriction of the maximum data rate depending on cable length for single CAN segments can be abolished for the over-all system by use of CG-ARM7/GTI. Both CAN busses are connected by a D-Sub 9 male connector. Also the power supply and the RS232 interface have D-Sub 9 male connectors. Any (also temporary) stress in excess of the limiting values may cause permanent damage onCG-ARM7/GTI and other connected devices. Exposure to limiting conditions for extended periods may affect the reliability and shorten the life cycle of the device.